UMBC men’s and women’s basketball teams have both enjoyed an impressive season, generating excitement on campus and in the America East. For the men’s team, the experience was a remarkable turnaround, garnering recognition at the national level, while the women’s team continued to flourish and maintain a solid standard of play. The university welcomed Ryan Odom as new head coach of men’s basketball less than a year ago. In his first foundational year with the team, Coach Odom has led the Retrievers to recognition as the third-most improved NCAA Division 1 program in the nation, out of around 350 schools. Earlier in the season, the Baltimore Sun article “UMBC shooting past expectations in Odom’s first year” profiled the Retrievers as a promising team of players coming into their own. The piece shined a particularly bright spotlight on Joe Sherburne ’19, financial economics, one of the most accurate three-point shooters in the nation, whose performance has moved to another level in his second year on the team. Sherburne, a remarkable scholar-athlete, was also selected to the CoSIDA Academic All-District II First Team. By the end of the season, it was clear: the Retrievers offered one of the most dynamic offenses in among NCAA D1 teams this year, scoring an average of 81.4 points per game—25th in the nation—through March 5. The team also ranked 22nd nationally in three-point field goals per game and 19th in three-point field goal percentage. With a record of 18-12, the Retrievers advanced to the first round of the America East championship tournament, defeated 74-65 by New Hampshire. They will next compete in the College Insider Tournament (CIT), their first postseason tournament since 2008, when they last won the America East Conference title. UMBC will host a first-round game in the CIT on March 15, 7:00 p.m., in the RAC (purchase tickets online). 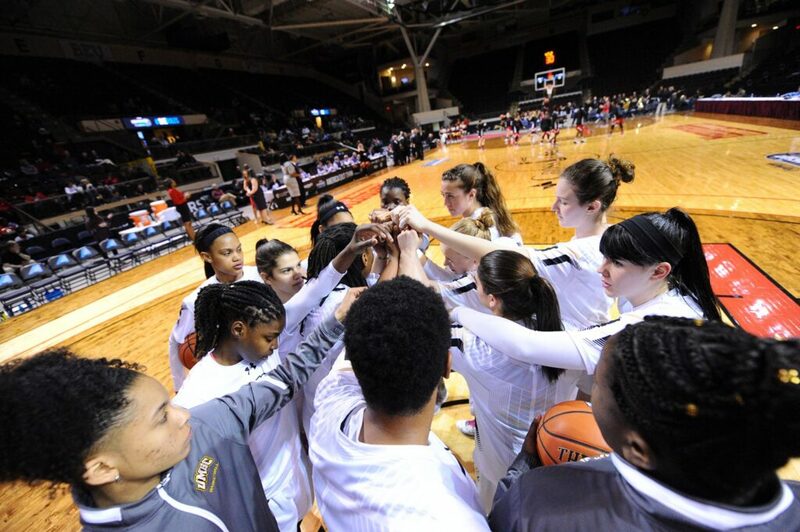 UMBC’s women’s basketball team, led by Head Coach Phil Stern, was beset by injuries for much of the season, but reeled off 10 wins in an 11-game span during America East competition and placed third in the league. Players received numerous America East All-Conference honors this year—the most All-Conference selections the team has earned since joining the league in 2004. Taylor McCarley ’17, psychology, received First Team and All-Defensive Team Honors, as a conference leader in scoring, assists, free throw, and steals. She now also ranks as one of UMBC’s top women’s basketball players of all time in scoring, assists, and steals. Laura Castaldo ’18, health administration and public policy, earned Third Team honors after ranking third among America East players in three-point field goal percentage. Pandora Wilson ’17, health administration and public policy, was named to the All-Academic team, honoring her notable performance as a scholar-athlete, including her induction into Chi Alpha Sigma, the National College Athlete Honor Society. The UMBC women’s basketball team will next compete in the Women’s Basketball Invitational Tournament against Brown on Thursday, March 16, at 7 p.m. in the RAC (purchase tickets online). UMBC’s basketball coaches are feeling gratitude for the achievements of the past year, and are eager to continue developing the teams. Header photo is Coach Odom, by Marlayna Demond ’11 for UMBC.